I hope this Library will give you, and especially the young people among you, a better understanding of the history and the nature of the presidency and the government of the United States. 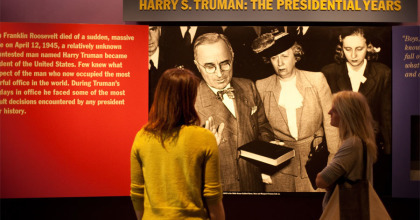 The major issues and events of Harry Truman’s presidency are highlighted in this 10,500-square-foot exhibition. 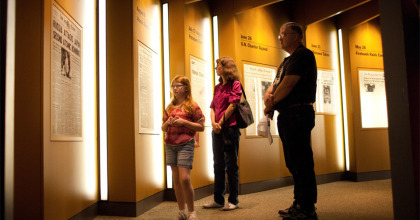 Featuring two decision theaters, enhanced audio and video programs, and dozens of interactive elements, this exhibition forms the centerpiece of the Truman Library’s world-acclaimed Museum. This 15-minute film by Academy Award-winning director Charles Guggenheim traces the story of Harry Truman’s early live and then ends dramatically with the death of FDR and the swearing in of Truman as the 33rd president of the United States. 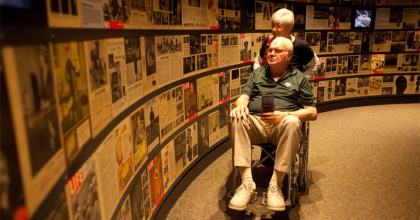 Ten enlarged, backlit panels bear images of newspaper front pages highlighting the dramatic string of events that dominated the first four months of Harry Truman’s presidency, including the ending of WWII. Historians and policy analysts have questioned President Truman’s decision to use the atomic bomb against Japan. 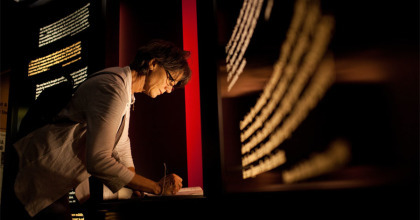 After exploring this gallery, visitors are invited to share their views. After WWII, America’s standard of living soared, suburbia was born, and new appliances, televisions, and a host of other material goods entered the consumer culture. Favorite items on display in this gallery include vintage electronics, television shows and commercials and other iconic images from the early 1950s. In stark contrast to the boom in America, Europe was devastated by the war and continued to suffer poverty, starvation, and political unrest. As economic conditions worsened, Communist parties in the nations of Western Europe, especially France and Italy, gained in strength. An ocean away from these troubles Americans looked on, many with rising concern. The crisis in Europe grew into a global confrontation between the United States and the Soviet Union. 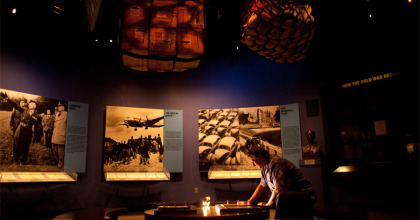 A main focus of this area is the Berlin Airlift, President Truman’s response to the Soviet blockade of Berlin in 1948. 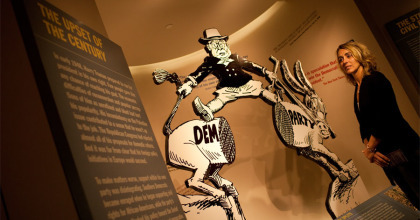 While in this gallery, explore exhibits on the Truman Doctrine, the Marshall Plan, and the formation of NATO. On May 14, 1948, President Truman was the first world leader to recognize the new state of Israel. A featured artifact in this gallery is the Torah given to President Truman by Dr. Chaim Weizmann, the first president of the new state of Israel. 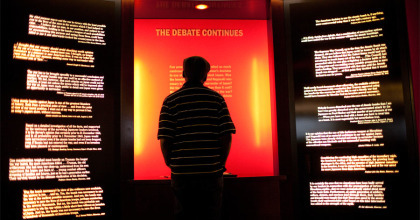 Step inside an interactive theater to experience presidential decision making. From recognizing the State of Israel to desegregating the U.S. Armed Forces, what values would drive your decisions if you were Commander in Chief? In early 1948, Harry Truman prepared to run for president in his own right. Few pundits gave him any chance of re-election, but on November 3rd, Americans rose to news of the most surprising comeback in presidential election history. How did he do it? Find the answers in this popular gallery. Truman hoped to enact a broad program of domestic reforms including national health insurance, public housing, civil rights legislation, and federal aid to education. However, little of what he called the “Fair Deal” was ever made law. Instead, his second term was dominated by events overseas that fundamentally altered America’s foreign policy. In Asia, the Cold War would heat up dramatically, raising anxieties of Americans at home. 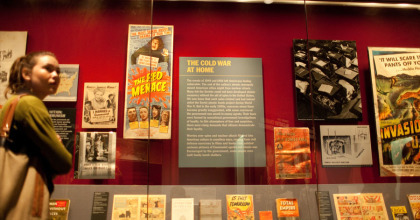 Worries over spies, nuclear attack, and the specter of communism filtered into American culture in countless ways. 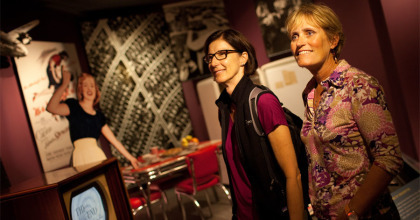 Visitors step through Truman’s “Ten Fateful Months” and listen to historic audio recordings of contemporary news reports, Truman’s words to a nervous nation, and Senator McCarthy’s cries of a “Red Scare.” Exhibits on the Korean War – and President Truman’s controversial firing of General Douglas MacArthur – conclude this section of the exhibition. Museum visitors are in the hot seat as the grilling begins: where do we, as a free nation, draw the line between privacy and freedom of speech and the needs of national security. The topic is as timely today as it was 60 years ago. In his farewell address to the nation he reviewed the accomplishments of his Administration and made his case to history. He correctly predicted America would one day win the Cold War. A life-size bronze statue of Harry Truman (a favorite spot for visitor photographs) looks out a wall of windows to the beautifully groomed Courtyard and the gravesites of President and Mrs. Truman. 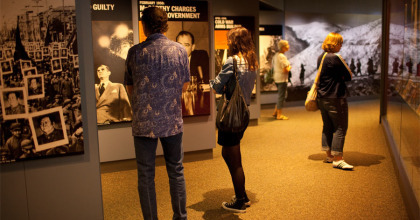 This final multimedia exhibit asks, Who’s Quoting Truman? The answer is, Nearly everyone! This is the best presidential library and museum I have visited!